So you need a new sporran. You’ve looked online and in the shops and you know what you like but you’ve seen sporrans from £30-£500 and in the picture they look pretty similar. So what’s the difference in all these sporrans and how do you know which one is for you? Sporran buying guide to the rescue. A walk down Edinburgh’s High Street and it’s easy to see sporrans for as little as £20. It’s worth pointing out that these fine establishments also sell ‘Finest’ Scottish Whisky for £3 a litre but the point still stands. Similarly a quick look on ebay and you’re getting the same bargains. As you can imagine the quality of these pieces isn’t great but they’re perfect for some situations. For us this is ‘Situation A’, a handcrafted genuine sporran may not be the wisest purchase. Their are budget sporrans out their that are ideal if you’re not looking for something that lasts or you know it may not be the most refined occasion and your sporran might have a rough time. As I’m sure you can imagine the craftsmanship on these sporrans aren’t up to the same standard as other offerings and they are likely factory produced rather than hand crafted, but you’re probably not too concerned about that. Our verdict: If you’re getting a sporran for a one off event or you know it’s not going to be looked after than a budget sporran could be ideal. Grab it and enjoy whatever you’re up to, it will be perfect and any time it lasts past your event is a bonus! A further search around the internet or a wonder into some slightly more established looking Scottish Dress shops and you’ll notice a range of mid priced sporrans selling for around £80-£180. The claims are of quality materials, real leather and good craftsmanship, and often they’re right. A number of overseas manufacturers have done a good job of replicating an original Scottish sporran and the quality of these pieces can be close to that of a Handmade Scottish piece. They are usually made outside of Scotland and therefore can’t claim the heritage and tradition of the Scottish sporran but as a result can often access cost savings and therefore can be produced for less. A very similar product to a handmade Scottish Sporran without the made in Scotland tag, which may or may not be important to you. Our verdict: If you’re on a particular budget or aren’t concerned about the process or the heritage the making this could be the option for you. If that’s the case then you’re on the wrong website. For Artisans of Scotland this is what it’s all about. 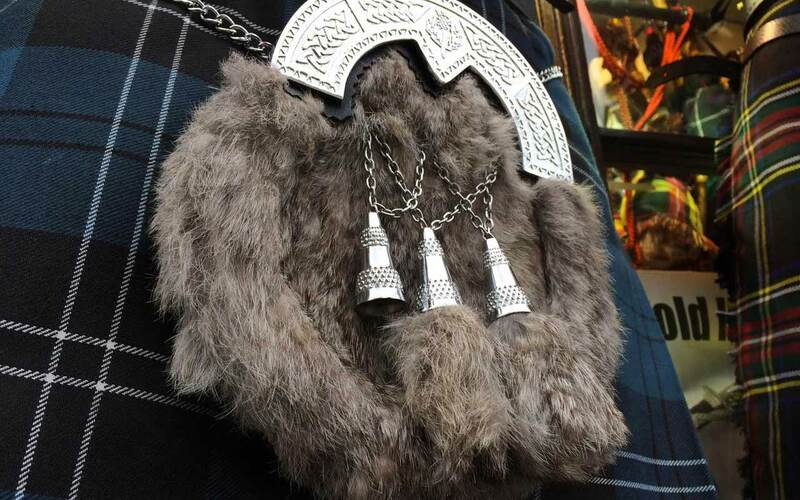 Handmade Scottish Sporrans that carry the traditions and stories of the country and it’s history. As you can imagine these are the most expensive in the range but we believe it’s worth every penny. Let’s face it you don’t wear a kilt for practicality or comfort, especially the socks. Wearing a kilt is about a connection to Scotland, about heritage and history, about roots and what has come before and that’s why we love handcrafted Scottish sporrans. Your sporran should be with you for life, at the biggest occasions. Hogmanay’s, weddings, you’re wedding, you’re children’s weddings. It should be done properly. Our sporran makers make sporrans they expect to be with you for life, they still get people coming in to alter sporrans they bought from the great grandfather. Our verdict: A sporran is for life, not just for Gary’s stag. We love the history and heritage of Scotland and if you’re celebrating that heritage by wearing a Scottish kilt then we think you should celebrate the artisan and invest in a handmade Scottish sporran. It wont let you down. If you’re making the investment to celebrate Scotland, wherever you buy you’re sporran, make sure you ask for handmade in Scotland. Some companies sell items with misleading tags like ‘product of Scotland’ which can be a little sneaky so if made in Scotland is important to you then make sure it is. Or if you’re not doing anything now, why not got to our sporran builder and get building. Our Edinburgh sporran maker handcrafts everything right here in Scotland’s capital.